Down the years Mark Wastell, proprietor of the world’s greatest record shop Sound323 has made a lot of CD recommendations to me. I go to bed with the words “Oh that one is essential, trust me” (You’ll have to imagine your own Essex boy accent haunting my sleep, but if I am honest he very rarely gets it wrong, having learnt my taste down the years almost better than I have. Last year he pointed me towrds A catalogue of sounds the Jakob Ullmann disc on Editions RZ, a release by a composer I had never heard of when I made the purchase but one that turned out to be amongst my very favourites of 2006. On Wednesday I stuck my head around the door of the shop briefly as I was in town, and whilst I was scouring shelves to find something of interest I was pointed to a disc by Mark that has again proved to be a great little find. Six Duos by Stefano Scodanibbio. Scodanibbio is a well respected contrabass player (contrabassist?) that worked with Luigi Nono a lot, with Nono thinking enough of him to dedicate a composition in his name. 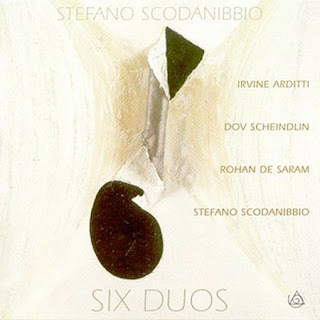 On Six Duos Scodanibbio is the composer as well as playing on three of the tracks. The pieces are performed by Irvine Arditti (violin), Dov Scheindlin (Viola), and Rohan de Saram (Cello) in all six of the possible duo formations. Scodanibbio’s composition on these pieces investigates extreme harmonics, testing the muscians and their instruments to the limit in search of finite sounds. The technical stuff is of little interest to me howver. as I like this disc simply because of the way it sounds, the sparklingly bright playing and the playful intertwining of the two instruments. The harmonic elements make for an intruiging listen however. Every so often sounds appear that don’t resemble the instruments themselves, the second piece, Escondido for violin and cello in particular begins with a series of high pitched whistles and wails that twist around each other to produce further sounds again. The fifth, Jardins d’Hamilcar for volin and contrabass heaves from sullen bass dwindling into thrashy violin parts and back again with exuberant ease. The best description I can think of for Six Duos is exciting music as it is brim full of colour and energy. This is one CD I think I would struggle to put on and be miserable to, uplifting stuff, thanks Mark. As my classical investigations continue, another purchase I made this week was a further disc by Dmitri Shostakovich, a split disc of his Sonata for Violin and Sonata for Viola, both rearranged in versions for soloist with string orchestra. 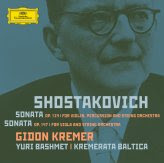 I bough this disc because the violin sonata is performed by Gidon Kremer, a musician I have really enjoyed on the previous discs I have purchased of his playing. the Kremer recital is very nice, but I actually found myself taken more by the Viola Sonata, played by Yuri Bashmet, which is a deeply moving, mournful piece, the last movement of which seemed to turn the air cold here as it drifted to its beautiful conclusion… OK, so thats me being melodramatic on a rainy Sunday afternoon, but it sounded good anyway! If you haven’t already in your “classical investigations”, I hope you make sure to listen to BartÃ³k’s String Quartets (there are six, and they are all excellent). Of the couple recordings I’ve heard, I like the Takacs quartet one the best. The other, by the Emerson String Quartet, unsurprisingly was not nearly as enjoyable for me, but I’m not a fan of almost any of their recordings (often cold and sterile). So out of interest why would I want to hear the Bartok? What do you liek about it? and what’s wrong with the Emerson versions? Not being awkward, but I somehow need to ake sense of what otherwise just becomes a list of suggestions! But I’m going to have to stick my oar in supporting the Emersons. (They can do no wrong IMO.) I vastly prefer the Emerson’s take on Bartok quartets â€“ precisely BECAUSE it’s a lot more “cold and sterile” (though those aren’t the adjectives I’d choose). You really hear Bartok as a dissonant modernist in the Emerson’s hands, whereas for me the Takacs is too folksy. While I’m championing all things Emersonian I should also recommend their performance of Nono’s string quartets too. I will seek out the Bartok then, and whichever version I spot first I’ll investigate. Regarding the Emerson’s playing of Nono… there is only the one Nono string quartet is there not? I don’t have an Emerson recording of it, can it still be purchased? Yes, sorry a rogue ‘s’ incorrectly pluralized Emerson Quartet’s Nono recording. And I’m afraid I have no details on the recording, as it was simply one file among hundreds of others that I got from pillaging a friend’s iTunes. I was going to recommend Gidon Kremer’s recordings of Bach solo sonatas & partitas, but I see you already know them. Which recording did you get? I only know his recent recording of them on the ECM label, which came out about two years ago. It’s a great disc â€“ he places seemingly utterly randomly â€“ in all sorts of capricious places. My classically trained, Bach-obsessive friends absolutely hate it, which only makes me love it the more. I have two versions of the Kremer Bach. One is a burn from the 1980 Philips release made for me by a dark, mysterious (and ludicrously tall) friend that reads these pages, and the other is the ECM version. I think I prefer the ECM, but I need to play them side by side again really. What immediately struck me about the Kremer when I heard it (the ECM) for the first time in the car during a long drive home from Newcastle was the gritty, aggressive harshness of the playing. He has a really dirty, abrasive style that resonates through the piece, almost butally emotive. Ã…s for rÃ¥ndomly plÃ¥cÃ©d Ã¥ccÃ©nts, yÃ©ah thÃ©y can be rÃ©ally nÃ®cÃ©….